Where have all the screensavers gone? | Who Says Penguins Can't Fly? So, I’ve had this problem a long time and never bothered fixing it. 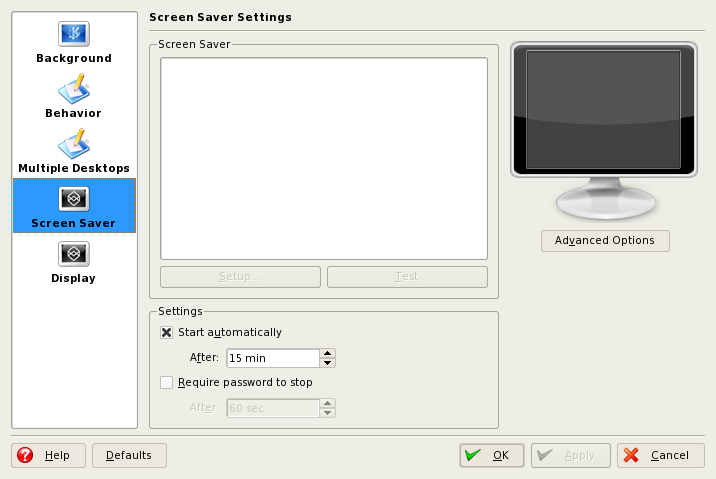 It’s about screensavers in KDE. More specifically, the non existing screensavers – when I try to configure them, all I get is an empty list. Apparently, this problem was user specific. By creating a new user, I could confirm that the screensavers still were there. So, it has to be a config file I thought, and started digging in ~/.kde. The ~/.kde/share/config/kdesktoprc looked suspicious, so I deleted it. Or rather, I renamed it to kdesktoprc2 to let KDE recreate the file. But still no screensavers. Then I stumbled upon this bug report. I tried to delete (once again, I renamed it to keep the original one as a backup) ~/.local/share/desktop-directories and ~/.config/menus. Warning! This will reset KMenu to its default settings. After logging out and in again, I found that my screensavers were back (not sure if you have to log out though). Neat. Now I’m going to change my screensaver from the analog clock to something more flashy.